The opioid epidemic was first declared a public health emergency in 2017. If you are struggling with opioid abuse or believe a loved one may be in need of addiction treatment, there are some important facts to consider as you decide how to best proceed with the recovery process. According to the CDC, about 115 Americans die each day as the result of an opioid overdose. This includes overdoses of prescription opioids as well as heroin. Victims include people of all ages, races, genders, and socioeconomic backgrounds. Opioid overdoses now account for over half of all drug overdose deaths in the United States. As a result, overdoses are now the leading cause of death for Americans under 50 years old. This means younger Americans are more likely to die from an overdose than to be killed in a car accident or in a firearm-related incident. Alcohol and opioids are both considered central nervous system depressants. When taken together, they intensify each other’s sedative effects. This leads to low blood pressure, low body temperature, dehydration, vomiting, respiratory depression, and an irregular heart rate. A fatal overdose can occur without the victim even realizing anything is wrong. Opioids play an important role in providing pain relief after surgery or when a patient has a serious chronic illness. However, opioids are being prescribed in amounts that far exceed their recommended usage guidelines. The amount of opioids prescribed per person in 2015 was triple what it was in 1999. Opioid addiction is often referred to as an accidental addiction. People get hooked on prescription opioids by not following instructions after surgery or illness. They develop a tolerance and physical dependence, resulting in the need to engage in doctor shopping or purchasing drugs on the street to keep up the high doses they crave. When prescription opioids become too expensive to obtain, people often turn to heroin to fulfill their addiction. A New York Times article describes this phenomenon in greater detail, pointing out that heroin is less than 1/10 the price of black market OxyContin in many places of the country. We often think of substance abuse as being confined only to the person actively taking the addictive substance, but parental opioid abuse can have disastrous consequences for children. Hospitals across the United States are struggling to cope with the increase in opioid-dependent newborns, toddlers are dying after accidentally consuming a parent’s opioids, and state foster care systems are being overloaded with children who have been taken away from their parents due to drug-related abuse or neglect. An article in the Huffington Post provides a heartbreaking look at what happens to the children of parents who abuse opioids. Naloxone, often sold under the brand name Narcan, is a medication that can temporarily reverse the effects of an opioid overdose. This provides the victim with time to seek proper medical treatment, but does nothing to treat the underlying cause of the addiction. For this reason, expanding access to naloxone for paramedics, emergency medical technicians, police officers, firefighters, and other first responders is just one small part of addressing the opioid epidemic. Quitting opioids abruptly can cause a number of complications, including severe dehydration, electrolyte imbalances, and lung infections due to breathing the stomach contents back into the lungs after vomiting. 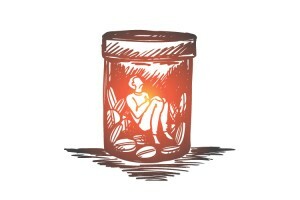 Withdrawal complications can be fatal if medical treatment isn’t received, as evidenced by the high-profile deaths of opioid addicts in police custody who were forced to go through withdrawal with no medical care. The safest option is a medically supervised detox, where 24/7 monitoring is provided by a team of trained professionals. Medication assisted treatment (MAT) for opioid addiction is endorsed by the American Medical Association, the American Academy of Addiction Psychiatry, and the American Society of Addiction Medicine. The medications used to treat opioid addiction do not result in the patient getting high or cause impaired cognitive function. They only reduce cravings and withdrawal symptoms, giving the patient time to work towards a sustained recovery. In our culture, we wish for a “quick fix” to problems. Unfortunately, substance use disorders are considered chronic illnesses. To promote lasting sobriety, treatment needs to address the underlying issues that created the need for substance abuse while promoting the development of healthy lifestyle habits and coping skills for handling stressful situations. This is typically accomplished with cognitive behavioral therapy and holistic treatments such as art or music therapy. The experienced staff at St. Joseph Institute are committed to offering evidence-based personalized care for men and women struggling with opioid addiction. To learn more about how we can help you or your loved one, contact us today, at (888) 352-3297.